makinghealthierdecisions | Eat Healthy. Stay Active. Balance Life. Celebrate St. Patrick’s Day with a fun and tasty green smoothie called, “Shamrocks & Gold.” After testing several recipes, I finally created the right combination of ingredients to make a tasty, kid-friendly green smoothie. There are a few tips and tricks to make it tasty and healthy! One trick is to blend the recipe in stages to help make it smooth, but don’t forget to check out my note’s section after the recipe and nutrition information for additional tips. Try this recipe and let me know what you think in the comments below! Add apple juice and spinach leaves to blender. Blend first to help make it smooth and avoid leafy chunks. Place the remaining ingredients in the blender. I’m always looking for a dip that is tasty and healthy to enjoy with my family and friends. Salsa recipes with fruit are always a hit because they provide the perfect combination of sweet and savory. This Mango Tango Black Bean Salsa recipe from the Canned Food Alliance is easy to make, provides protein and fiber from the black beans, tastes amazing, and will be a great addition to your recipe collection. See my notes at the end for some of my tips when making this recipe. Combine beans, mango, corn, onion, and cilantro in a medium bowl. Stir in lime juice, garlic powder and cumin. *I substituted 1 fresh mango cut into dices for the canned mango. Check out my “Simple Tips for Cutting a Mango” blog post with a video to learn more. **In the grocery store, I could only find an 11 ounce can of corn with peppers, so I just used the whole can in the recipe to help me reduce food waste. It still turned out great! ***The average lime yields about 2 tablespoons lime juice. Using about a teaspoon more or less than this amount shouldn’t affect the flavor of the recipe. If you get more than this, Alice Henneman, from Cook It Quick, suggests adding it to your orange juice for a mini flavor boost. Thanks to the Canned Food Alliance for inspiration! Find more canned food recipes and tips at mealtime.org. Did you know my state of Nebraska is 4th in the nation in black bean production? Way to go Nebraska! Have you ever tried cutting a mango? It is not simple at first, but not impossible. One of my recipes called for fresh mango, and I had never cut a mango before. In the beginning, it was a disaster. I finally found an easier way to cut mangos, so I created a video. With a little practice, you will become a mango cutting machine in no time! Remember to always wash produce before cutting it. Check out this video to learn a few simple tips to help you cut a mango into dices. Not for sure if the mango is ripe? The National Mango Board has great tips on how to choose a mango. Looking for a snack that is simple and healthy? Trail Mix is a perfect snack to eat on the go or at home. It does not require refrigeration, so it can be tucked away in your office desk drawer or packed in a bag when you need a quick snack. Be careful though, some trail mix recipes may not be healthy. When making a homemade trail mix, you are in control of the ingredients. Follow these 5 strategies to make a healthier trail mix. Whole grain cereals with low amounts of sugar or air-popped popcorn make a great addition to a healthy trail mix. Whole grains are healthier than refined grains since they are packed with the following nutrients: zinc, magnesium, B vitamins, and fiber. Look for products that include a whole grain stamp or whole-grain ingredients such as brown rice, buckwheat, bulgur, millet, oatmeal, popcorn, quinoa, rolled oats, whole-grain barley, whole-grain corn, sorghum, whole-grain triticale, whole oats, whole wheat, and wild rice. Dried fruit can help you reach your daily recommendation of fruits. A ½ cup of dried fruit can be considered as 1 cup from the Fruit Group. Dried fruit are naturally sweet, so remember to avoid products that include added sugars such as sugar or corn syrup in the ingredient list to avoid extra calories. Snacks high in protein may help provide satiety and appetite control. Include your favorite nuts and seeds to add protein to your mix. My favorites would include almonds, cashews, pumpkin seeds, or sunflower seeds. Buy them unsalted to help keep your sodium intake low! A lot of people like a sweet and salty trail mix. Including a dash of sweet can be part of a healthy snack, in moderation. My favorite sweet to add is dark chocolate because it has antioxidants that may help to lower blood pressure and LDL cholesterol. Choose dark chocolate that has at least 70% cocoa in order to receive the most health benefits with not as much fat and sugar as other chocolates. Otherwise, you can include a dash of candy coated chocolates. Depending on your ingredients, calories can add up fast and the trail mix can turn into a high-calorie snack. Nuts & seeds have a lot of calories, but provide many nutrients and healthy fats. Candy has a lot of empty calories, which are calories from solid fats and/or added sugars that provide little or no nutrients. Choosing higher calorie ingredients means you have to pay attention to portion size. Snacks usually range from 100-200 calories. Don’t forget to eat the right portion size that fits your calorie needs in order to not gain weight. A 1/4 cup of trail mix will usually provide you with the right amount of calories and nutrients to make it a healthy snack. Below is a trail mix recipe that I like to use personally and share with my nutrition classes for all ages. You can even see a video after the recipe that I created to help promote trail mix as a quick and healthy on-the-go snack. Try the recipe for yourself, and let me know the results. If you have a favorite recipe to use, post that as well. I would love to have your feedback. Pour 1/4 cup trail mix into a snack-size storage bag. I used SuperTracker’s My Recipe to analyze this recipe for nutrient information and food groups. Food Groups: Fruits 1/4 cup and Protein Foods 1/2 oz. August 31st is National Trail Mix Day! Find more recipe ideas from Nebraska Extension’s Food Calendar. *Reference to commercial products or trade names is made with the understanding that no discrimination is intended of those not mentioned and no endorsement by University of Nebraska–Lincoln Extension is implied for those mentioned. Eating healthy is so expensive! Or, so I hear. I’m going to share with you 10 tips to help you eat healthy on a budget. It all starts with remembering the 3 P’s – Plan, Purchase, and Prepare. Determine your food budget by completing, “Family Budgets: Developing a Spending Plan that Works.” Next, figure out how much money you can spend for each trip to the store. If you shop weekly, then take your monthly food budget and divide by four. Remember to follow your food budget. MyPlate illustrates the five food groups that are the building blocks for a healthy diet using a familiar image—a place setting for a meal. Before you eat, think about what goes on your plate or in your cup or bowl. Taking the time to plan your meals ahead of time can help you save money and calories. Planning healthy meals is easier when you follow the MyPlate guidelines. Explore your cupboards and refrigerator to create a list of food items already on hand and try to include them in your meals at the beginning of the week. Try to incorporate the five food groups: protein, grains, fruit, vegetables, and dairy. Look at the weekly grocery store ads and coupons for cheaper meal ideas. Add stews, casseroles, or stir-fries for budget-friendly meals. Use beans in recipes for a few meatless meals. Use a piece of paper, calendar, menu planning board, or app to create weekly or monthly meal plans. Create a shopping list after you’ve planned meals by writing down the foods you need to buy and how much. Shop quicker by grouping items according to the store layout. Stick to your shopping list to help control spending and avoid impulse purchases. If you are hungry when you shop for groceries, you are likely to buy more and not stick to your shopping list. Before heading to the grocery store, eat a healthy snack such as trail mix, apple slices with peanut butter, a piece of fruit, or whole-grain crackers with low-fat cheese. Compare products for the best deal by looking at the unit prices, which show the price per pound or ounce. It is usually listed on the price tag. Larger containers usually have the best unit price, but if it spoils before you are able to eat it, then it is not the best buy. Limit buying foods that have no nutritional value such as soda, candy, and chips. Concentrate on buying foods that contain a lot of nutrients such as fruits, vegetables, whole grains, lean meats, beans, and low-fat or non-fat dairy products. Don’t forget to read the Nutrition Facts label to compare items in order to select the healthiest option. Buying in bulk usually saves money as long as you have the space. Check your storage space before deciding to stock up on frozen or shelf stable foods. Purchase family packs of chicken, steak, or fish if you have enough freezer space. Buy large quantities of canned or frozen fruits and vegetables when they are on sale. For fresh foods, buy only the amounts you can use before they spoil. I like to prep my meals on Sunday afternoon and separate the foods into smaller containers, so they are ready to take for my lunch at work. Do you need a quick physical activity break or game to help make fitness fun for youth? I created a fitness activity, which I call FitBall, to help incorporate physical activity breaks during my middle school summer nutrition program. A three-five minute physical activity break helps everyone get moving and energized while providing a quick “brain break” that helps students stay focused on learning. Middle school and elementary students enjoy playing this fitness activity. Similar to hot potato, Fitball is a fun activity that can be used as a physical activity break or game for youth. Participants arrange themselves in a circle. DJ starts the music and participants will hand or toss the beach ball from one person to the next while the music is playing. DJ will randomly stop the music. The person left holding the FitBall when the music stops will pick the fitness activity that is closest to their right thumb. The group will complete the chosen fitness activity, but make sure everyone has the appropriate space before starting the activity. Return to your group circle and continue playing the game as time allows. If an exercise is chosen that has already been done during that activity, I recommend the participant to pick the closest exercise that has not been completed. Participants will be tempted to hit the ball like a volleyball and may cause the activity to become louder due to students getting excited. If you would like a calmer game, instruct students that they cannot hit the ball. Using a permanent marker and the list of fitness activities below, write 3-4 fitness activities per color panel on a 12-inch beach ball. Modify or change exercises as needed, but I would recommend including at least 3 exercises per panel. Under you account, click your email address (or name) in the top right corner and select Settings. Click the Save Changes button when finished. Learn how to change the setting for your phone or tablet at http://help.pandora.com/customer/portal/articles/24645-enable-explicit-filter. Customize your radio station by clicking “thumbs-up” or “thumbs-down” if you like or dislike a song being played. 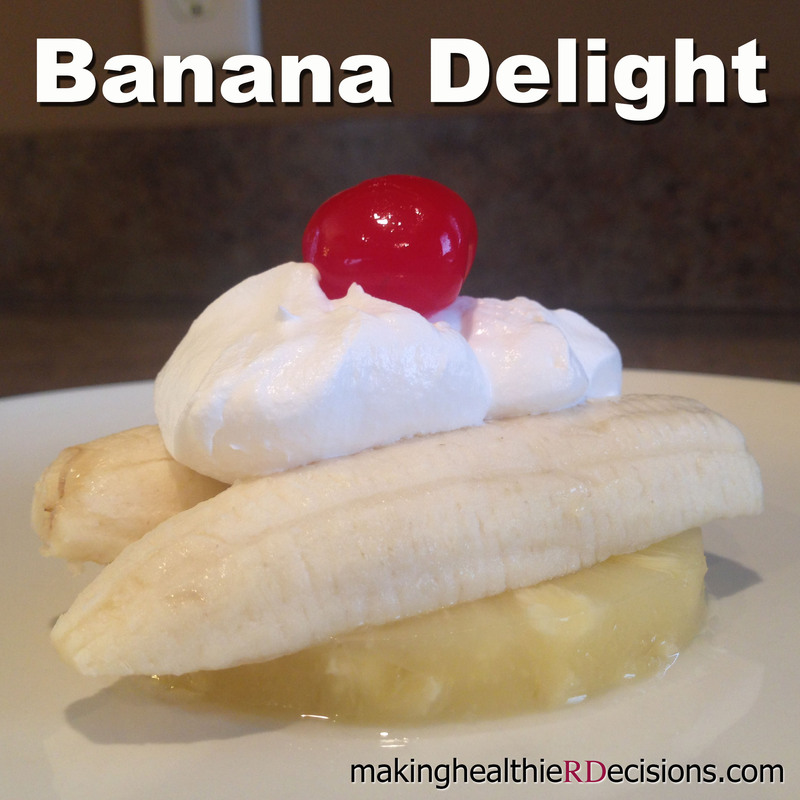 I stumbled upon Banana Delight this past summer when I was looking for healthy recipes to utilize during my Kids in the Kitchen 4-H Workshop. The recipe was located within a Nebraska 4-H Curriculum called, “Making Food for Me Helper’s Guide.” I chose to have the youth prepare this recipe for a dessert as part of their meal. It is a healthier dessert since one serving has 3/4 cup of fruit towards your daily recommended intake. 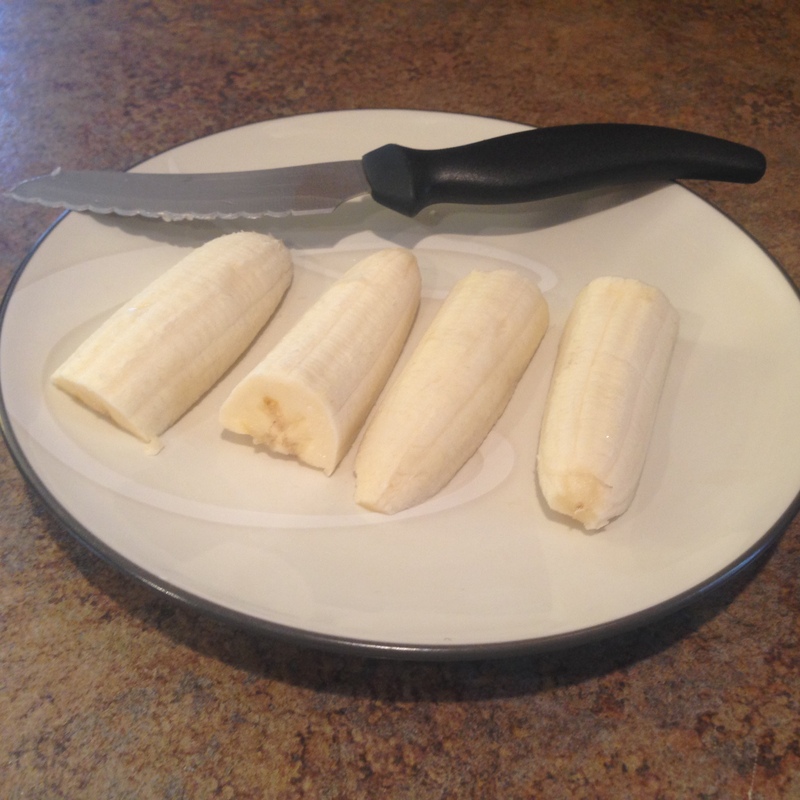 Last week, I decided to have middle school students prepare Banana Delight as a healthy snack during my 4-H Food Smart Families class at a local school. They were super easy to make in the classroom, and at the end of the class, the students voted “No Thank You,” “Liked It,” or “Loved It” towards Banana Delight. All 17 students voted “Loved It!” Plus, several youth told me the following week that they made this recipe with their family. So, I say the recipe is a winner! Let me know if you have the same success as I have with this recipe. Want to make an even healthier version? Substitute 2 tablespoons of low-fat vanilla yogurt for 2 tablespoons of whipped topping. This will add 27 calories to the recipe, but you will gain more healthy nutrients like protein and calcium instead of saturated fat! Two tablespoons of whipped topping has 25 calories with 1.5 grams of saturated fat and 2 grams of sugar, so in moderation it can be part of a healthy lifestyle. 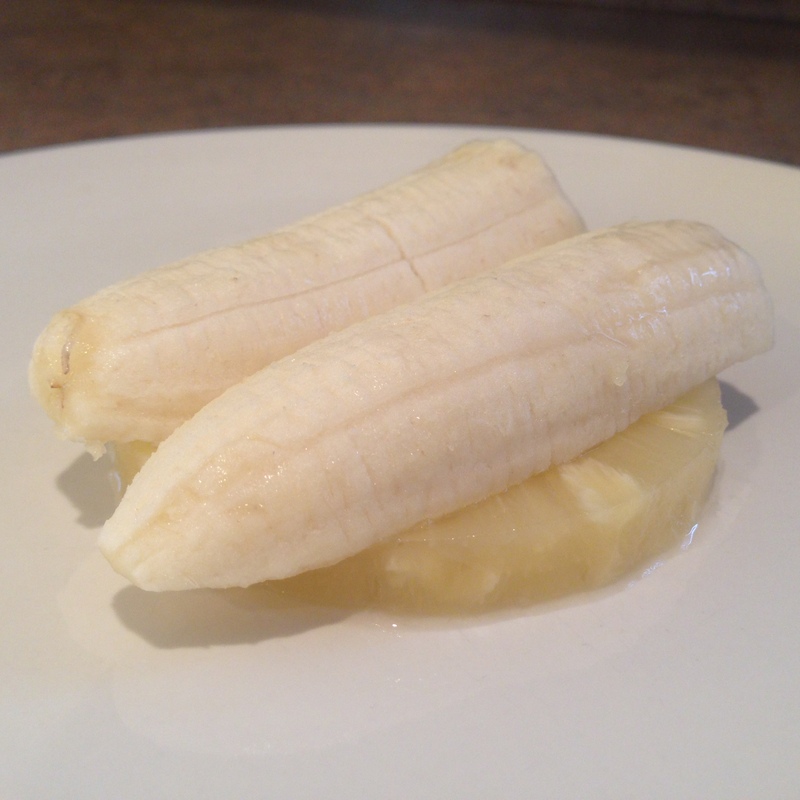 Cut bananas in half lengthwise. Cut each half cross-wise. 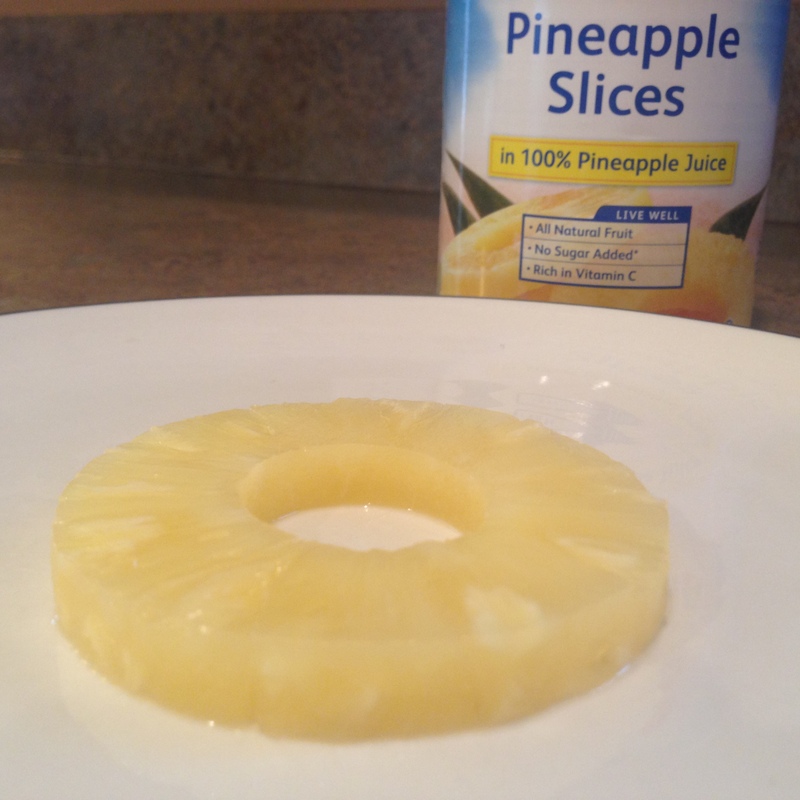 Place one pineapple slice on a plate. Top with 2 banana slices. Top banana slices with 2 tablespoons of whipped topping and a cherry. ENJOY! Place one pineapple slice on a plate and top with 2 banana slices. 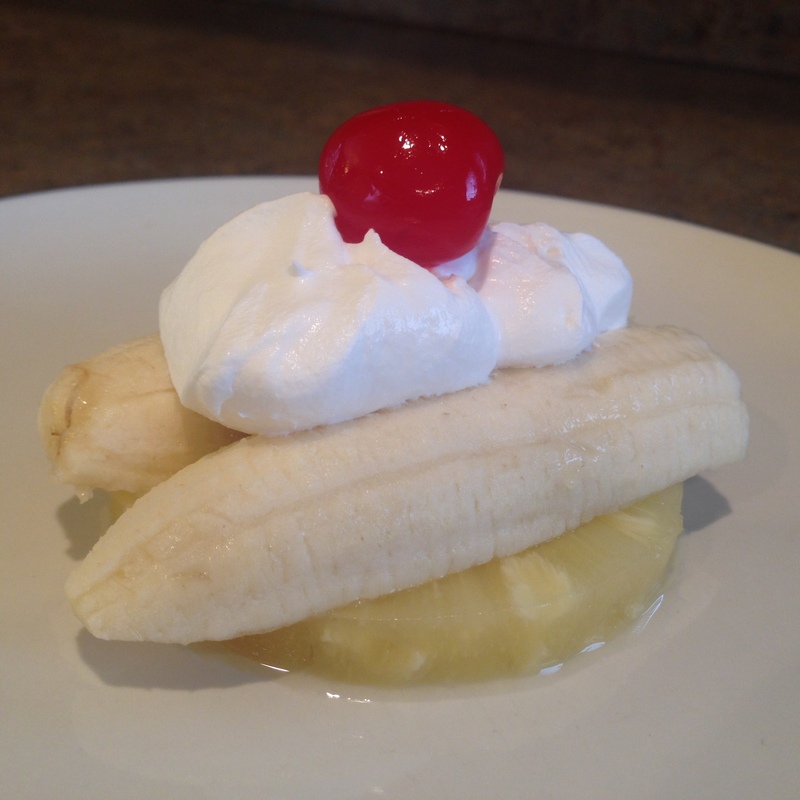 Top banana slices with 2 tablespoons of whipped topping and a cherry.